A light hearted, cute and fluffy romcom from tvN called Ex-Girlfriend Club wrapped up its run exactly 8 days ago. It’s a recommended drama if you just want to relax and enjoy the trip. The story tells about Bang Myung Soo whose webtoon is famous and gets adapted into a movie. So far everything sounds fine, right? NOPE. Apparently his webtoon tells about his past love relationships with 3 women who he describes as Cat, Lion, and Fox. Each ex has their own characteristic and when they hear about the news it turns Myung Soo’s world upside down includes the producer of the movie, Kim Soo Jin‘s life. Life is joking with them when it turns out that Kim Soo Jin also has stories with Myung Soo. Everyone is well-cast even though I’m sure they could have gone for better leading lady. 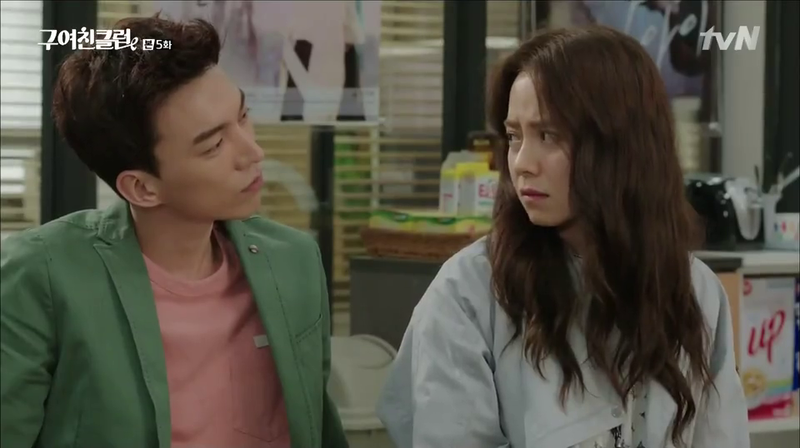 It’s not that i’m Song Ji Hyo anti, she’s fab in this drama but there are times that it felt like she was holding back and stiff, of course not all the time. Byun Yo Han nailed his role as Bang Myung Soo. His Misaeng image was so fresh and strong in my memory when i first watched Ex-Girlfriend Club so i didn’t expect him to act all cute and lovely in this drama. 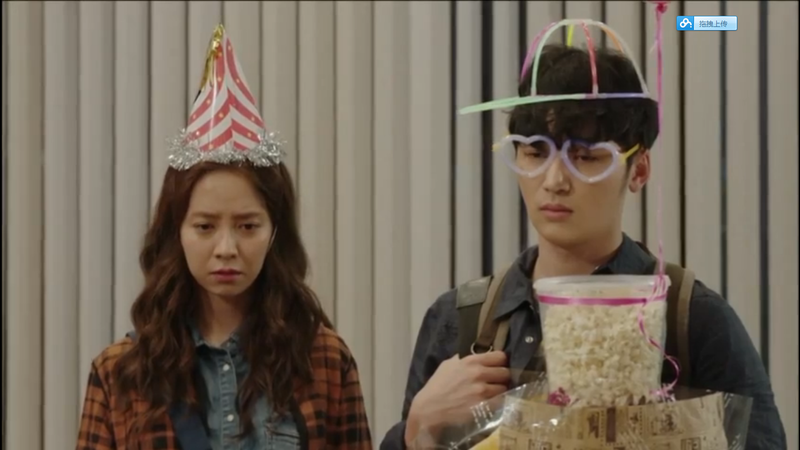 Ji Hyo and Yo Han looked awkward at the first few episodes maybe they were still warming up, but after few episodes their chemistry was over the roof. They looked good and cute together. Ra Ra, played by Ryu Hwa Young, was hands-down my favorite character out of three exes. Ra Ra was a free-spirit young lady and Hwa Young did extremely great in portraying the character. I didn’t know that she’s an ex-idol, i thought that she was a rookie actress judging from her excellent acting. Her reactions were on point and hilarious. 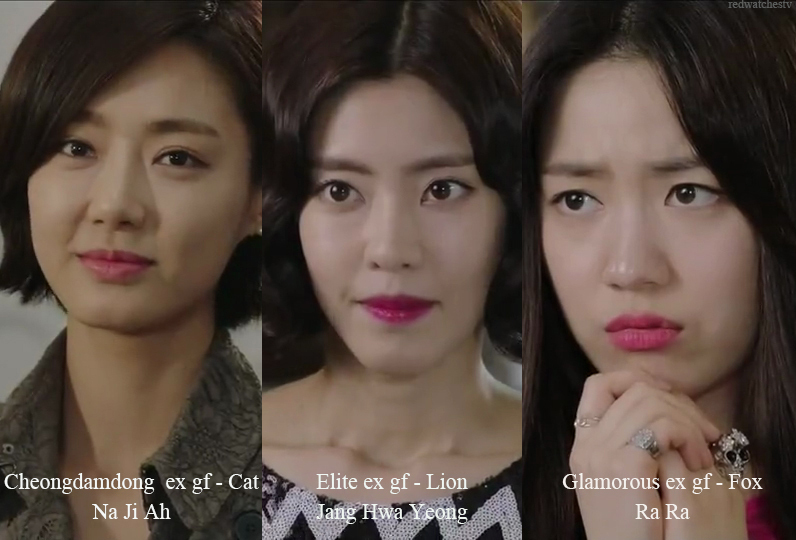 Also when we’re talking about the Fox, don’t forget about the Lion, Jang Hwa Young, played by Lee Yoon Ji. I think it’s the first time for me to actually like her in a drama. Her presence on her previous works just didn’t catch my attention, i knew she was on those dramas and i didn’t really care about her character. She made Jang Hwa Young’s presence so strong in this drama and she was great in acting a wicked yet weak woman. All scenes were beautifully shot, great camerawork and not even one dull scene. tvN claimed that by cutting down 4 episodes to 12 eps from the initially 16 eps was to keep the quality high. I don’t know what quality that they talked about, was it the writing/directing or was it because they were running out of budget to film 4 more episodes. My guess is, they didn’t have that much budget to cover another 4 episodes (my guess. my guess. my guess). Maybe they used different camera set and apparently it’s more expensive than what the public broadcast dramas normally use? Because there was not even one scene where the scene looked so dull, everything was HD and it’s a rarity in public broadcast dramas. The high quality scenes will be a treat for your eyes if you decide to watch Ex-girlfriend club! The episode opened with some high-ranked ministers enjoyed drinking in a gisaeng house. The opening scene made me think that i had downloaded a wrong drama. I thought i accidentally had downloaded an episode from Hwajung (the only sageuk drama airing at the time being) and not Ex-Girlfriend Club. I SERIOUSLY THOUGHT I HAD DOWNLOADING HWAJUNG until Song Ji Hyo’s face appeared on my laptop screen. Then we learned that Park Soo Jin was in the middle of recruiting an actress for her company’s new project so that’s why she dressed up like that. The opening scene really fooled me lol. The series started off with a bland, weak and boring episode. 30 minutes into episode 1 i was considering to drop the series. The last 5 minutes before ep 1 ended piqued my interest (can be watched here). Finally after yawning for 55 minutes, something piqued my interest. From that 5 minutes i could see Ex-Girlfriend Club was the one to watch every week. It had a lot of potential and it convinced me to watch the 2nd episode to see how it would be going. The 2nd episode was much better than the pilot episode, it was a drastic improvement. The 3 exes were officially introduced plus their own characteristic and the cat fights started. The plot got thicker overnight, making the series much better. I think there are two highlights in the series; first, the progression of the three exes friendships. They were strangers to one another but thanks to Myung Soo they got to know each other and by the end of ep 12 they became good friends. The process of their friendship was natural and felt like there was no pressure. Second, Myung Soo and Soo Jin’s relationships was like just what normal people would have. The progression from just friends then close friends then to couple. It focused on everyday people would act and react to the situation. And i think that it’s brilliant and refreshing. Finally something that we can relate to after countless of unrealistic love stories these past few months served on our plate. One thing that made Ex-Girlfriend Club different than other shows airing in the same period as it was its comedic touch. Every episode was loaded with funny scenes and it made 60 minutes felt like 30 minutes. I had a great amount of laugh during my watching. All characters’ reaction was superb! Soo Jin and Director Jo actually looked cute together! Director Jo and Myung Soo rivalry was so funny! Who can forget the legendary fight scene on ep 11? The plot was tight and the cutdown was a shame. The show still had potential and the story could have been deeper and more complex. It’s not the story was not deep enough but it could be deeper than that. I was actually expecting a fierce love triangle from them two (+Soo Jin) but the writer made Director Jo let Soo Jin go that easily such a gentleman! I don’t ask for 4 more eps, i’m only asking 1 more episode to cover all the unanswered questions. Soo Jin and Myung Soo had a deep convos and Myung Soo revealed that he had fallen in love with Soo Jin way before that one rainy night. He revealed that he used to follow her everywhere. It’d be great if we had a chance to see the cute, like lost-puppy Myung Soo followed Soo Jin around. THE MOVIE! It’d be great (too) to see the three exes criticizing the actresses who portrayed them. With people like Ra Ra, Hwa Young and Na Ji Ah how funny the scene would be. Also, THE BEAR! Myung Soo’s new webtoon. He went to coutryside to find “inspiration” for his next project yeah even though he draw Soo Jin’s sketch at the end but how nice it’d be if they show us that his next webtoon also hit daebak and also being offered to be adapted into a movie/drama. HWA YOUNG’S WEDDING PARTY!!!! AND NA JI AH FOUND A NEW GUY! Also RA RA AND DIRECTOR JO! Okay, i ask way too much. The music choice is so smart. They inserted the correct BGM to compliment the scene. If you watched the drama and if The Roses of Sharon Have Blossomed doesn’t get stuck in your head then you’re lying. At least you remember the part “mugunghwa kkoch-i pieossseubnida”. Also, this song called 알록달록 by JANNABI, if it doesn’t get stuck in your head then you’re also lying. At least you’re familiar with the chorus. Will I Watch it Again? Probably no but it’s definitely rewatchable. ps, other caps that didnt make it to this post can be seen on this album. All caps are mine, do not take it out from my imgur album.